Paylines: Specific lines along which series of symbols count as wins. Please note: The number and orientation of paylines may vary depending on the slot machine you're playing. How do I see the paylines for a slot machine? Tap the menu (≡) button. Swipe to the paylines page. 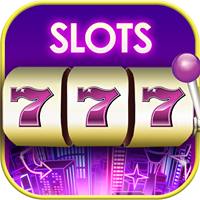 Most slot machines allow you to choose the number of paylines on which you wish to play. On some slot machines, however, the number of paylines may be fixed. Slot machines automatically bet on all paylines present at that machine, though you can change your bet amount. To change your bet, tap the ‘+’ and ‘-‘ buttons on the sides of the total bet indicator, which shows the rounded bet amount. To bet max, you can tap ‘+’ until you reach the max bet available, or you can also hold the ‘+’ button for 3 seconds to switch to max bet immediately. Each payline can only pay out once per spin, so if multiple wins are hit on the same payline, only the largest win will credit for that particular payline. 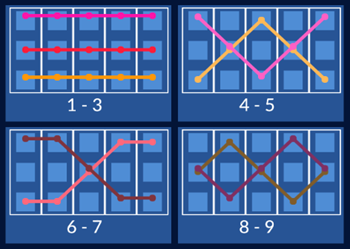 Paylines run from left to right on most slot machines – some machines will have additional information in the payout guide regarding different gameplay types. For a series of symbols to count as a win, the first symbol must fall on the far left reel, followed sequentially by the other symbols. The combination must fall on a valid payline, and you must have bet on that payline to receive a payout. The piggy bank symbols above fall from left to right along a valid payline. The first symbol in the winning series falls on the far left reel. The series falls on a valid payline, but the first piggy bank symbol does not fall on the far left reel.